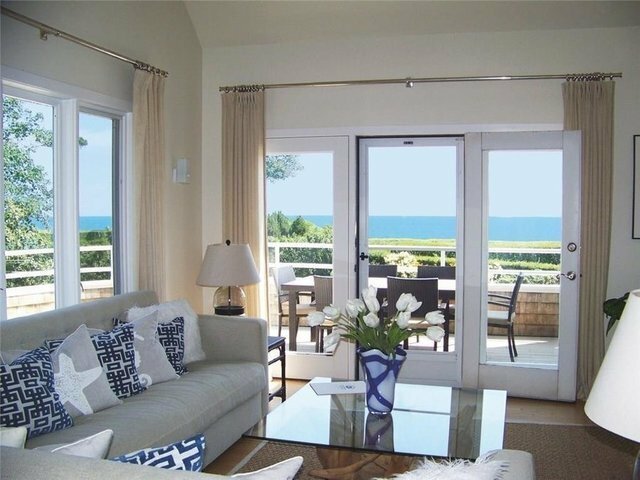 Stunning ocean views and sensational location on the Ocean Drive! A gated entry welcomes you to this charming seaside cottage, Seaglass, which overlooks Newport's famed rocky coastline and scenic Cliff Walk where the crashing surf on one side and magnificent mansions on the other never fail to impress.Sited on a rare one acre, it abuts Rough Point, the former estate of tobacco heiress Doris Duke. The four bedroom, three and one-half-bath home with shimmering pool has a New England shingle-style charm. A sun-drenched open floor plan offers stunning ocean views, hardwood floors, double-sided wood-burning fireplace, and direct access to the ocean-facing wraparound and partially covered deck perfect for family gatherings, relaxation, and enjoyment of the boating activities on the ocean.A well-equipped kitchen adjoins the breakfast room with ocean views, and opens to the expansive deck for grilling, dining, and entertainment. The lowest level has a finished private office and offers opportunities for a media or exercise room.Outdoors, the home is enhanced with beautiful mature plantings, swimming pool, outdoor shower, and spacious shed for additional storage. Seaglass offers all the joys of seaside living; idyllic location, glorious ocean views, close proximity to fabulous beaches, short stroll to Bailey's Beach, nearby access to the majestic cliff walk, and only minutes to the mansions and center of town. Architectural expansion plans are available upon request.